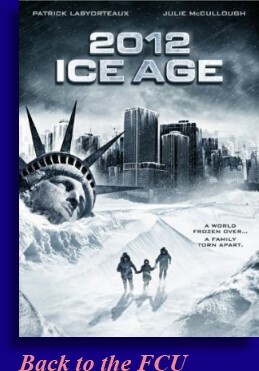 While It does seem a little late in the game for The Asylum to get around to mockbusting 2004’s ‘The Day After Tomorrow’ but this is what we have, kind of, with the epic crapterpiece ‘2012: Ice Age’, the third.. count ‘em, third… ‘2012’ movie we’ve seen from the erstwhile hardworking film studio. I think we can slot this one, as far as entertainment value is concerned, by placing above the absolutely, stupefyingly horrific ‘2012: Doomsday’, but it does fall short of the pure magical insanity that was ‘2012: Supernova’. I don’t believe the year is actually 2012 and I didn’t see a single Mayan during this movie but the year is unimportant since 2012 is simply a marketing strategy. If you put a number in front of your movie, Video on Demand customers, who apparently don’t like to scroll, will see your numbered movie way before they make it all the way down to ‘Zebra Crossing’ or whatever. Genius. Right off the bat I can inform you that I have no idea of the science behind this one. I saw people talking and words were coming out of their mouths but hell if I could make heads or tails of what they were trying to say. What I do know is that a big chunk of the North Pole has broken off and is racing to America to muck us up. This is where we are introduced to Bill Hart (Patrick Labyorteaux) who is some kind of scientist who is aware of this thing and is working like the dickens to get his family out of Maine. Before this happened Dr. Bill dropped off his disrespectful, but admittedly hot daughter Julia (Katie Wilson) at the airport so she could go back to college in NYC to be with her boyfriend (Kyle Morris). Then armed with the bad news he motors, along with his whiney teenage son Nelson (Nick Afanasiev), to pick up his phenomenally bitchy wife Teri (Julie McCollough). I mean Dr. Bill goes to his wife’s office to pick her up so they could escape to Aunt Sissy’s house in Florida to avoid certain death, and all this wife of his could do was verbally berate and belittle my man. True enough, if you look at Dr. Bill he does seem like somebody who’s been belittled quite a bit in his day, but that’s besides the point. Anyway, we have this evil glacier racing down the east coast at 200mph, again I don’t know why, and it’s crushing everything in its path. First Newfoundland, then Boston and it’s on its way to New York City. Yup, exactly where baby girl is. Now don’t think that our government is sitting idly by allowing this disaster to happen, no sir. First they send jets to missile strike the hell out the glacier which made the glacier chunk off into super huge 100 foot flying daggers. Then they decide to nuke the glacier which made the glacier chunk off into super huge 100 foot flying daggers. Then they decide to depth charge the glacier making the glacier chunk off into super huge 100 foot flying daggers. While it was pretty clear that bombing the glacier wasn’t going to work, we admire their steadfast dedication to futility. But this is about our family. Recognize that the daughter has been led to almost certain death to New Jersey by her sickly looking boyfriend. Regardless, our fractured family must drive a beat up car… Dr. Bill had to physically roll up the window in his car whenever he had to talk to somebody, a feature in autos I didn’t even know still existed… crash this car, steal a car, blow up a street, get jacked by a psycho bum, break into a house, help a black dude, fly a Cessna, and crash a Cessna before making it to Jersey to be united with their baby girl. Not save their baby girl because it’s the end of days and all, but to be reunited so that they all can die together like a real family should. Unless something amazing happens, like the Glacier getting tired or something. One thing I like about The Asylum is that they take care of their own. While I’m unfamiliar with Travis Fort, the director of this movie, I’d bet he started out at The Asylum mailroom. If you are fortunate enough to get a gig at The Asylum and hang around for a couple of years, eventually they will let you direct a movie. That’s awesome. I have been actively championing myself for a job at The Asylum for years, fully recognizing that it would be a significant pay cut considering the healthy chunk of change I make doing what I do know, but it’s fallen on deaf ears. Dang. But back to ‘2012: Ice Age’, was it a good movie? Of course it wasn’t, but that’s not really the point now, is it? The shoddy special effects, suspect acting and erratic pacing are pretty much a given so we find our entertainment in other regions, and believe me, there is entertainment to unearth if you dig for it. Such as when the Colonel (Sean Corey Cooper) and his helicopter pilot watched and smiled gloriously when they depth charged that mountain of evil ice, beautiful explosions all around them. Sure, they probably should’ve been trying to fly away instead of grinning like idiots, but I do take solace in that the actors live on, even if the characters they were playing are dead. Or when the guy, around 6’6" 265, tried to beat up the boyfriend, about 5’6" 115, and take his coat because it was cold and stuff. What was he going to do with that coat? Use it as a leg warmer? I also enjoyed ‘The Day After Tomorrow’ Sudden Freeze Effect, even though it only happened once. And that glacier was nothing if not inconsistent. One minute its flash freezing folks, the next minute it’s dropping snow colored confetti on them, then it will drop a twister or two on you… make up your mind Mr. Glacier! I know the plan was to melt the glacier with the nukes, but did the government think about the potential ramifications of melting a 200mph glacier the size of North Carolina? Of course they didn’t. Damn government. Can we give special props to Ted Monte as the Psycho Bum? Of course we can, it’s my article. Mr. Monte was on his A-Game and probably should be allowed to direct the next Asylum disaster movie they have in the chamber. If they had put some Ninjas or Hillbillys in this movie instead of whiney kids, then it could’ve challenged ‘2012: Supernova’ and its magic, but we didn’t get any Ninjas. But we did get some poorly acted nonsense with suspect effects. Oddly enough, this is what expected and it’s always a good day when one can find their expectations met.